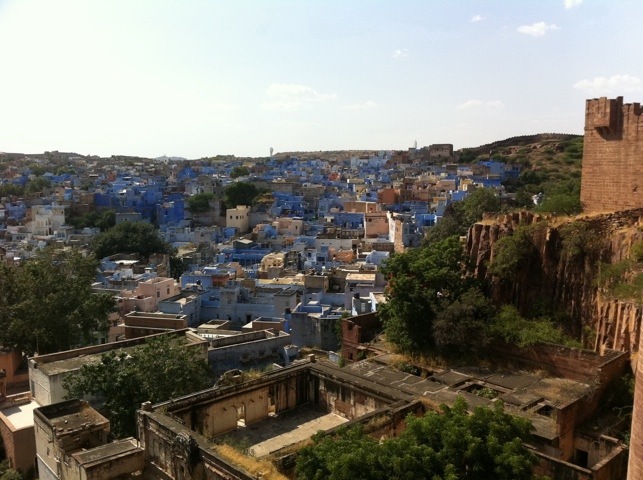 We had two hopes for our time in Jodhpur – that it would live up to the moniker ‘the blue city’, and that we would catch sight of the famous horseriding trousers in their place of origination (they were invented here for an English gent during the times of the British Raj, and he started a fashion trend). Sadly only the first came true, although the festival we discovered shortly before we arrived more than made up for the lack of riding leather! The fort here is simply magnificent! I thought that after the last two I had perhaps run out of fort superlatives, but this really deserves credit and is a real highlight of our visit to India so far. Firstly, it’s massive, dominating the skyline above the expanse of the million-strong city beneath, and providing commanding views for miles around. Secondly, it has the best audio tour ever (and it’s included in the price). Titbits picked up include the sad tale of the man who volunteered (although we’re wondering quite how optional it was) to be buried alive in the foundations of the fort to rid it of a curse from the former occupant; the handprints of queens past who in their final departure from the palace would make a vermillion imprint by the door before joining the king on his funeral pyre in the (thankfully now banned) practice of sati; and the cleverly disguised decorative alcoves up high in the king’s reception chamber which provided a place for female royals to listen in to the advice he was receiving so they could later provide a helpful comment or a counterpoint. In light of recent moments of amnesia Laura believes this is actually because the women could remember what was said! 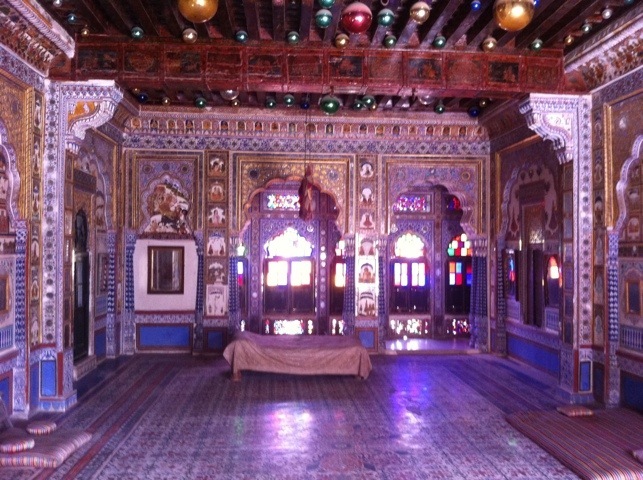 The palace in the fort was also brilliantly beautiful, with the soft light coming through the brightly coloured stained glass shining on the smooth sandstone walls. There were a couple of rooms that made Laura actually gasp with delight when they came into view, including a bedroom – complete with slightly out of place Christmas baubles – that we would have gladly swapped for our hotel room at almost any price! The rich history of the fort was told with an emphasis and nuance missing from so many of the guides we’ve had so far on our travels, and this was complemented by the views over the city below. Many more than in the pink city, Jodhpur’s walls are frequently painted in light blue to serve two purposes – apparently as cooling during the hot summer months (not quite sure about the physics on that verses the usually preferred white), and as a natural insect repellant (again, not quite sure about the biology there…). Still, it looks great, with the cube-shaped houses of the old city rich in colour to match the fort’s history. 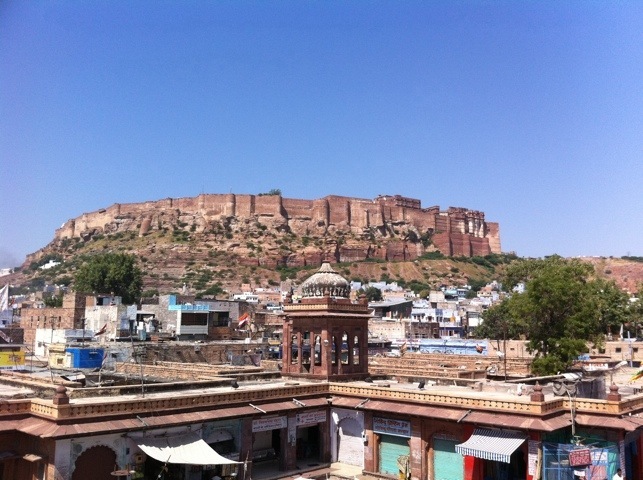 We’d started our day by seeking out the Marwar Festival, an annual celebration of local culture, and found something altogether bigger and more energetic than the drab tourist-targeted flop we’d imagined. There were marching bands! And camels! And actually, a marching band on a camel (the only one in the world)! And we got invited to join in! Ok, so we sat on a cart for a bit, but we were part of the procession through town for a few amazing minutes! 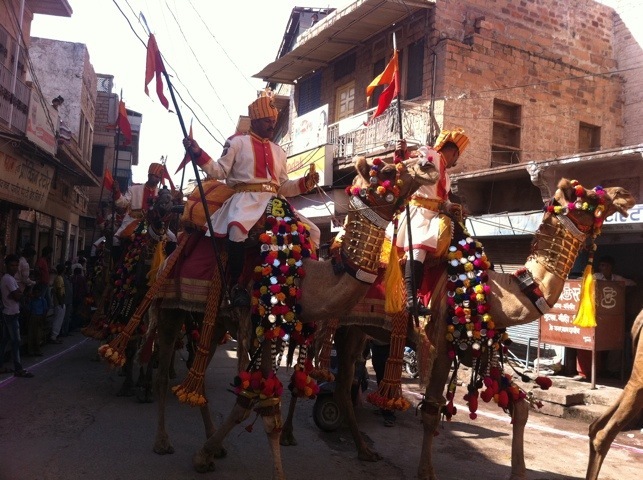 The camels were brilliantly dressed, with red rugs fringed in orange, and their necks covered with a glittering web of mirrors and balls of brightly coloured fabric. As the camel-pulled carts wound their way through the old town, they (and we) were showered with flower petals, most raining down from above, but a few thrown more vigorously directly at us at point blank range (and these were still attached to the flower heads). We’re certain there must be an age-old saying somewhere that you’ve never really experienced local life until you’ve been pelted with flowers and have bruises to show for it! The afternoon of the festival consisted of what was to all intents and purposes an unlikely combination of school sports day, summer fete and military pageant at the local football pitch. There was a marching band competition, of which the highlight for us was the prisoners from a nearby prison. We weren’t quite sure if perhaps it was all part of some elaborate escape bid on their part – an incongruous combination of badly out of tune bagpipes, shaking of tambourines, and drumming that would have been better placed in a samba club. I’m sure there’s a movie in there somewhere once their escape makes the headlines! This was followed by the presentation of prizes – most memorably for best turban, and the highlight – best moustache. The photo speaks for itself, but I’ll just add one thing – the secret is to coil it round your ears for storage! To cap it off, there was a BSF Camel Tattoo. Some members of the Kazoo travelling team (who shall remain nameless) thought this was going to involve permanent camel imagery being etched on our midriffs in black ink – and so we were relieved to find twenty five camels with owners marching in various impressive formations, then with acrobatics, and finally with fire. And who says that border patrol is a boring job?! *ok, so perhaps not, but you get the picture! This entry was posted in India and tagged Festival by Simon. Bookmark the permalink. Great photos on your blog today, Simon. The blue seems to hover over the scene. 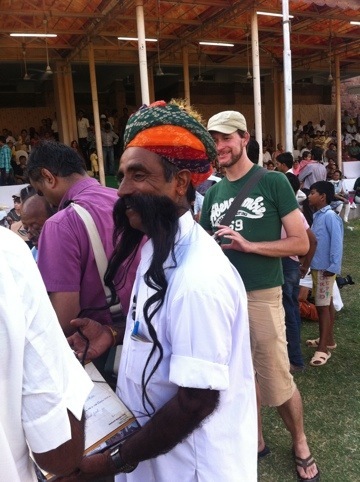 Maybe you could cultivate a similar moustache to the prize winning one as a souvenir of your Indian travels?